Depends on how you plan your trip: Are you going to eat and sleep in hotels, camping sites or just in your minivan (car). In Morocco, there are at least enough opportunities to eat and drink. The various petrol stations along the highways (toll) are well matched in luxury and comfort with European counterparts and generally cleaner than in Spain!. The only route that you should take into account is from the Moroccan – Mauritanian border to Senegal (750 km’s). There are very few facilities to eat and drink, with only one petrol station somewhere in the middle of the course. Because it can be terribly hot, dehydration poses a serious health risk. Two boxes with spring water (40 liters) will be enough to take with you. The stock is particularly important in case of emergency: Such as a car breakdown in an isolated area with no prospect of immediate assistance. Do not throw the empty water cartons: In Senegal and Gambia they are very happy to use them for different purposes. Provide for canned foods such as tuna salad or whatever is your liking. I once survived a few days on cans because of a ‘difference of opinion’ on an amount payable at the Senegalese border crossing. It made my bargaining position a lot stronger because I could sit out the negotiations completely self-contained. Painkillers are, of course, important to have at hand when travelling. Just buy some extra! They are often asked for at police checkpoints and military roadblocks. Confidence in Western medicines is near endless and the receiver will be very grateful. Don’t forget sun cream. Avoid problems! It is prohibited to bring alcohol into the Islamic Republic of Mauritania. Unless you are a car mechanician, there is no need to bring heavy tools. A good quality set of socket spanners, fork spanners, screwdrivers, Allen keys, torxs and a hammer will cover minor reparations. Due to some long stretches of corrugated road (i.e. the road from Rosso to Diama which is 80 km’s), tyraps may also come in very handy to reattach loosened car parts quickly. If you got stuck in soft sand and released air from the tyres to get out, a small air compressor will help you to pump the tyres back to normal pressure. A reliable jack and one (or better two) spare wheel(s) is a necessity. 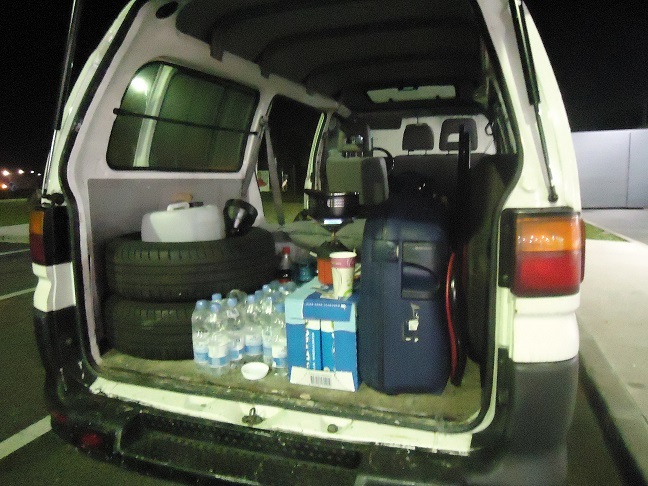 Take along a 10 or 20 liters barrel with tap water in case of engine overheating. In practice, you will use the water to refill the windscreen washer tank many times due to the dusty environment. Don’t forget a good quality strong flashlight. Provide for an extra set of bulbs (along the road very costly or not available at all), a set of fuses and a tin of motor oil. Possibly a set of belts (alternator belt and multi belt) and some waterproof tape. In Senegal, a fire extinguisher within reach of hand is mandatory and enthusiastically checked for by local traffic police (usually just outside St. Louis) . Safety vest, two warning triangles and a band-aid kit. Write down all information in the French language (A4 format size). Copy them about 40 times. At every checkpoint, hand them out to speed up passage. Tip! Bring along some pen sets or other small presents alike (‘cadeau s’il vous plait?’). The route through Europe is of course determined by where you leave home, but the destination is Algeciras in Southern Spain. To save money, you can choose to avoid toll highways in France and Spain. This saves you around three hundred euros (calculated from Northern France to Southern Spain). It is recommended to drive at night: The traffic during the day in the villages and towns is slowing you down too much. If you like to spent a well deserved rest in Marbella (80 Km’s from Algeciras), I can recomment this beautiful, yet cheap appartment . 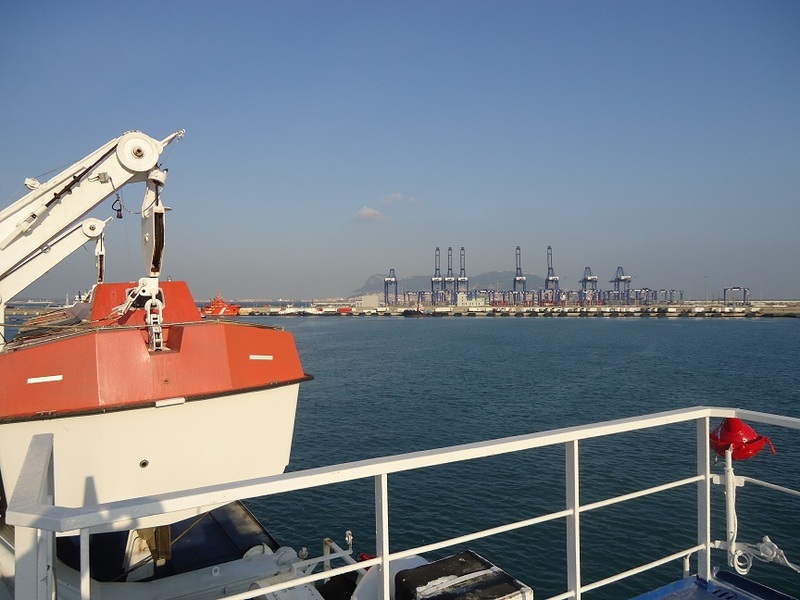 From Algeciras, there are several ferries that sail to different Moroccan destinations. Along the route, long before entering the town of Algeciras, you find small travel agencies where you can buy tickets for the ferries to Morocco. You can buy tickets in the town of Algeciras and the ferry terminals as well. The last time I made the crossing (spring 2013) it cost me about 120 euro for a Land Rover Freelander. Up to date fares and timetables can be found here on the internet. In the summer, prices are much higher due to many Moroccan families who spend their holidays in Morocco. The summer is not a good time to plan this trip because of the raining season in West-Africa (starting June) hence parts of the route are inaccessible due to flooding or even closed. You can choose from two destinations to resume the trip in Morocco. Either Ceuta or Tangier Port. The town of Ceuta is a Spanish enclave on the African continent. Traffic in Ceuta and the border with Morocco is hectic. It is a nice town to visit but personally I prefer Tangier Port. This border crossing is modernized and spacious. Use the ATM to cash some dirhams : Shortly after you need to pay the first toll highway (euros are not accepted).